It’s tricky, trying to glue the fragments of a family back together through photographs. This carte de visite by an unidentified photographer is one of only 11 in the Susan Bear album that has some identifying text. In the Washington County, Maryland Bear/Baer family tree I’ve constructed so far, the surname Heightman had not come up. Only when I searched ancestry.com records with a different spelling, Hightman, and without the initials M. L., did something slip into place. A Martin L. Hightman was born into a Burkittsville, Frederick County family of dry goods merchants about 1852. Burial records for other Burkittsville Hightmans brought up the grave records of his parents: John Hightman (1825-1891) and M. Elizabeth (Bear) Hightman (1825-1913). One of Susan Bear’s sisters was named Mary Elizabeth, and her birth year, about 1826, fit. Was there a record of a marriage between a Mary Elizabeth Bear and a John Hightman that fit the time frame? There was. Mary Elizabeth Bear and John Hightman married in Frederick County on 2 October 1851. 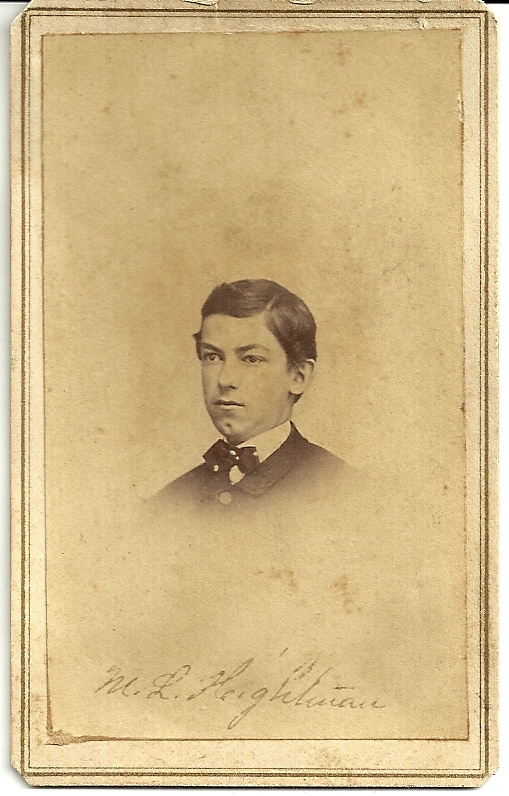 This photograph had to be of Mary Elizabeth Bear Hightman’s eldest son, Martin Luther Hightman (1852-1891). It was, judging by the subject’s age and the style of the carte, probably taken in the early to mid-1860s. Why it lacks a photographer’s imprint is hard to say. Certainly the photographers of Hagerstown and Frederick of the era–E. M. Recher, Jacob Byerly and others–promoted their work vigorously with a variety of advertising backmarks. The photographer may have been one of the many itinerants who worked during the Civil War. Or it could have been a copy. Like his father, Martin L. Hightman became a Burkittsville dry goods merchant. He was also the village’s postmaster. He and his wife Lovetta Arnold had five children: Frederick Arnold, Cora, John Roy, Harrison Martin, and Mabell E. Hightman. Frederick obtained a bachelor’s degree at Gettysburg College in 1902 and graduated from Gettysburg Theological Seminary in 1905. In 1908, Rev. Frederick Arnold Hightman (1876-1967) founded the northeast Baltimore congregation that became Ephiphany Evangelical Lutheran Church. The stone church in the Gothic Revival style still flourishes on Raspe Avenue just south of Belair Road. Martin and Lovetta Hightman are buried in Burkittsville Union Cemetery in Frederick County. Rev. Hightman is buried in Moreland Memoral Park, Parkville, Maryland, a few miles from his church. My very first memory of Rev. Frederick Hightman was in the 1950’s when I was deposited by my parents at Sunday school at Epiphany Lutheran Church on Sunday mornings. By that time in his career he had become Pastor Emertis at Epiphany. Retired from his duties as senior pastor he had more time to devote to the children of the church. It was from Pastor Hightman that I first learned about the Bible and had all of those wonderful stories read to me. He was such a kind and gentle man, quick to encourage and praise. On many occasions Pastor Hightman was a dinner guest in our home. He’d known my mother as a young girl. She was his violin pupil. In the early 1960’s Epiphany put a very large addition on the chuch. The largest part being a huge gymnasium size multi-purpose room, which they so rightfully named “Hightman Hall” in his honor.